At the end of last year, ARM announced ARMv8, the first ARM 64-bit ARM archtecture, and last week at ARM Techcon 2012, ARM announced the first ARMv8 cores: Cortex A53 and A57. But since there’s no silicon at the moment, what if you wanted to develop code running on ARMv8 before the hardware is available? The answer is: Fast Models, a Virtual Platform (VP) to accelerate software development. This is especially important for ARMv8 since hardware is not expected to be available for another year. In this post, I’ll first show how to run “Hello World!” in ARMv8 fast models, then we’ll run ARM Linux 64-Bit (Aarch64) in the virtual platform. In order allow the developer’s community to program for ARMv8 (Cortex A53/A57 cores), ARM has made ARMv8 Foundation Model, a virtual platform, available free of charge. The models require an x86 64-bit Linux machine running Red Hat Enterprise Linux version 5.x for 64-bit architectures, Red Hat Enterprise Linux version 6.x for 64-bit architectures, Ubuntu 10.04 (64-bit) or later. However, any x86 64-bit Linux distributions with glibc v2.3.2 (or greater) and libstdc++ 6.0.0 (or greater), should be able to run the models. I used a machine running Ubuntu Desktop 12.04 LTS 64-bit with the instructions below. To get started, visit the page linked above, and click on “Download Now” at the bottom of the page. You’ll need to login or register (It’s free), and then on the top right of the screen click on “Download Now” again to start downloading the V8 Foundation Model. You’ll a get a 8 MB file called FM000-KT-00035-r0p8-44rel23.tgz. Let’s work in a terminal window, uncompress the file and run the “Hello World!” application. tar xzvf FM000-KT-00035-r0p8-44rel23.tgz cd ~/Foundation_v8pkg ./Foundation_v8 --image examples/hello.axf terminal_0: Listening for serial connection on port 5000 terminal_1: Listening for serial connection on port 5001 terminal_2: Listening for serial connection on port 5002 terminal_3: Listening for serial connection on port 5003 Simulation is started Hello, 64-bit world! That’s it! Details are in in the document: DUI0677A_foundation_fast_model_ug.pdf, including instructions to access a web interface to monitor the machine, access to UART and more. hello.axf is a file based on “ARM Executable Format” that contains executable binary code generated with armlink linker part of the Keil ARM Compilation Tools. You can check the Makefile in the examples directory to see how armcc and armlink are used for the ARMv8 architecture. Now let’s do something a bit more interesting by running Linux (OpenEmbedded) in the v8 foundation model. The instructions I followed are available at http://www.linaro.org/engineering/armv8. Be patient, and after several minutes (12 minutes on a PC based on Intel Core 2 processor @ 1.8 GHz), you should see the command prompt. Running Linux in ARMv8 is nice, but what you really want to do is write and build programs for the platform. Natively build programs inside the foundation models is probably not a good idea for most programs, since it would be quite slow, so you’ll have to cross-compile for Aarch64. I’ll build the “Hello World!” application as explained in https://wiki.linaro.org/HowTo/HelloAarch64. ./hello Hello World! cnxsoft is in the 64-bit ARM house! Hello World! cnxsoft is in the 64-bit ARM house! And you could also try the minimal, LAMP or SDK Aarch64 images. there’s an alternative – the buildroot guys recently added their AArch64 buidl support too. On my i7-3820 the simulator loads/runs pretty fast! You definitely need a fast machine here. Thanks. Always useful to know alternative methods. My emulator is running, but without network. 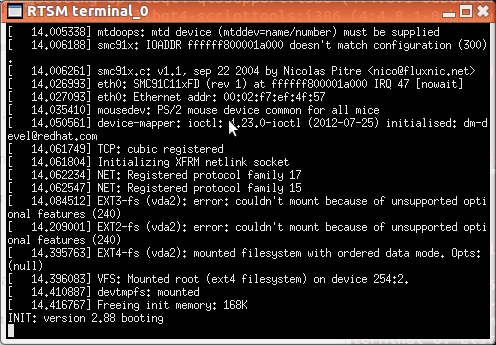 After “udhcpc”, I have a network via ifconfig. Alas, I can’t get outside the emulator: traceroute only shows stars. So … How do I get network running? Or, easier, how do I get files in and out of the emlulator? The buildroot is running now, but it’s download more that 1GB (“Cloning into bare repository ‘linux-7181edd0539e195f78adedbb6c3878f9f1e0c4bb’…”). Is that correct? Just leave it and see what happens in the end. BTW I run “make menuconfig” and selected ‘links’ (it’s a popular textbased web browser). When I run the image – udhcpc eth0. Then you can do: links google.com. See – it works. I also had network problems with Linaro’s OpenEmbedded image – don’t know what is the issue there. Tips how to get the network running? Since it’s using NAT, you may have troubles accessing private IP addresses, but public addresses (i.e. The Internet) should be accessible (I haven’t tried). If you want to use a local server, you can run to start the image with –network=bridged instead of –network=nat. Could you try your network connectivity within the ARM64 / aarch64 emulator? FWIW: Running on Ubuntu 12.10 64-bit. PS: I can ping the VM’s own IP address, and it’s default gateway. But that’s it. The VP is very slow on my machine, and I have to reboot to Ubuntu. It may take a while, before I try it again. But are you using bridged mode? If so, the VP should not have its own gateway, but use one of the IP provided by your router. OK, maybe bridged mode does not work yet. Anyway, using NAT should be fine since 8.8.8.8 is a public IP address. If you type “route” does it seem configured correctly? There are many product news at the moment, so many things to read. I think I’ll try it this week-end. It took a little whiile to figure out i had to use the middle button of the mouse to copy/paste text from an xterm terminal.., But network (i.e. wget) does work, just ICMP does not. Not able to download ARM V8 Foundation Model (FM000-KT-00035) after successful registration to arm . After clicking on download now section under public download it is asking to accept the license aggrmnt and endup without any option to download.